The Booth Society provides tours to groups and schools! All of our venues are staffed with knowledgable and friendly volunteers who can answer any of your questions and give tours of the Booth House, Von Bayer Museum and fisheries rail car. We will happily provide complimentary fish food for educational groups if we receive notice prior to arrival time. The museum collection includes fish management and culture items and equipment, periodicals, publications and personal artifacts. The collection contains over 185,000 items and is the largest collection of fisheries artifacts in the country, some of which are on display in the museum. The museum is open daily during the summer season. The collection management facility is open only by appointment. Coordinated by the Booth Society Executive Director at the D.C. Booth Fish Hatchery, the South Dakota Junior Duck Stamp Program is an annual art contest that provides students with the opportunity to learn about waterfowl conservation through art. The program is open to students in Kindergarten through 12th grade. Thousands of dolllars in prizes are awarded to the top 37 winners. The Best of Show art competes at the National Competition in Washington, DC. Find out more info! Click Here. The Fish Culture Hall of Fame was established in 1985 by the Fish Culture Section of the American Fisheries Society to honor persons who have made significant contributions to the advancement of fish culture. The Hall of Fame is located in a replica 1899 Ice House located at the D.C. Booth Historic National Fish Hatchery in Spearfish, South Dakota. Follow the link to the inductees, including biosketches detailing their significant contributions to fish culture. 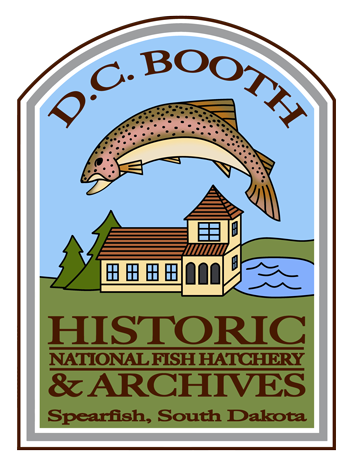 To nominate a fish culturist for induction into the Hall of Fame, contact the Chair of the FCS Hall of Fame Committee, or the Hatchery Hall of Fame Coordinator for nomination forms and information. Click Here to contact.